There's another zombie apocalypse game in town, and this one may remind you of a certain Arma 2 mod. I'm sure none of you are tired of zombies, right? Those frisky little devils still warm the cockles of your heart no doubt, and luckily enough new development studio Hammerpoint Interactive has created a survival MMO for you. This RPG The War Z will put you in the travel-worn boots of a survivor in the middle of a zombie apocalypse. If you're getting Day Z flashbacks at this point, you're spot on; this game isn't very far away from the Arma 2 mod that has become so popular it nearly fried its servers. According to executive producer Sergey Titov, Hammerpoint was working on The War Z before the Arma 2 mod took off, but once it did Hammerpoint started paying close attention. "We were like, 'Wow, that's cool, we're not the only ones making something like this,'" Titov said. Hammerpoint soon realized that the success of Day Z meant that they were on the right track, and they also started paying attention to what worked and didn't work for the Arma 2 mod. Titov makes it sound as though Day Z was a beta they didn't have to pay for, as he admits that "yes, of course some of our latest design decisions were influenced by the Day Z community forums." 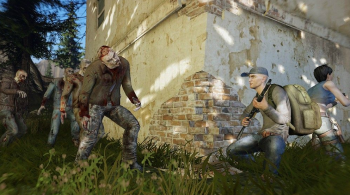 The War Z will hit beta soon, and is due for a PC release this autumn.